ArborCare Tree Service knows that when a storm hits, you don’t want to wait around for cleanup. 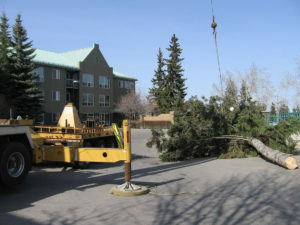 Broken branches and fallen limbs aren’t just an inconvenience, they can present a real hazard, and that’s why we offer a fast emergency tree removal service after a storm blows through Western Canada. Our crews are trained to handle the scene of the disaster quickly and efficiently, and we are available 24 hours a day to respond to emergencies. We will dispatch workers quickly to your site, where we’ll determine how best to assist you in your time of need. As a homeowner, leave hazardous emergency work to the trained professionals, unseen hazards can turn a home pruning job into a trip to the emergency room without warning. We put the safety of our customers and crews first, and you can count on us to proceed with the appropriate caution. To learn more about our Emergency Storm Response or Emergency Tree Removal Services, contact us today.